In this work, the effect of ligand's length on interaction energy of six oximes, A [2-(hydroxyimino)-N-((1-(2-(2-((hydroxyimino)methyl)-1H-imidazol-1-yl)ethyl)-1H-1,2,3-triazol-4-yl)methyl)acetamide], B [2-(hydroxyimino)-N-((1-(3-(2-((hydroxyimino)methyl)-1H-imidazol-1-yl)propyl)-1H-1,2,3-triazol-4-yl)methyl)acetamide], C [2-(hydroxyimino)-N-((1-(4-(2-((hydroxyimino)methyl)-1H-imidazol-1-yl)butyl)-1H-1,2,3-triazol-4-yl)methyl)acetamide], D [2-(hydroxyimino)-N-((1-(5-(2-((hydroxyimino)methyl)-1H-imidazol-1-yl)pentyl)-1H-1,2,3-triazol-4-yl)methyl)acetamide], E [2-(hydroxyimino)-N-((1-(6-(2-((hydroxyimino)methyl)-1H-imidazol-1-yl)hexyl)-1H-1,2,3-triazol-4-yl)methyl)acetamide] and F [2-(hydroxyimino)-N-((1-(7-(2-((hydroxyimino)methyl)-1H-imidazol-1-yl)heptyl)-1H-1,2,3-triazol-4-yl)methyl)acetamide] with tabun inhibited acetylcholinesterase (t-AChE) is investigated by using docking methods. 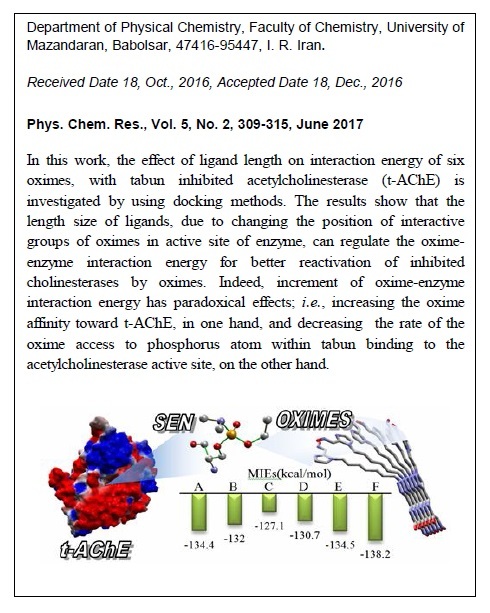 The results show that the size of ligands' length, due to changing the position of interactive groups of oximes in active site of enzyme can regulate oxime-enzyme interaction energy for better reactivation of inhibited cholinesterases by oximes. 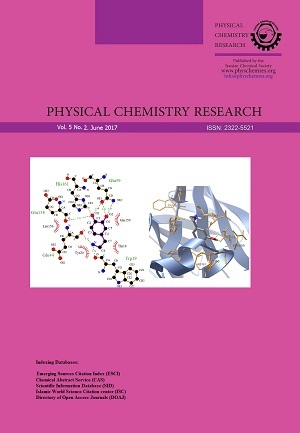 Indeed, increment of oxime-enzyme interaction energy has paradoxical effects both increasing of oxime affinity to t-AChE, and decreasing of the rate of the oxime access to phosphorus atom within tabun binding to the acetylcholinesterase active site. The obtained results show that to design an oxime as a drug, the length of oxime should be chosen in a size that the interaction of oxime and enzyme is neither too weak to couple, nor too strong to limit oxime mobility in reactivation t-AChE after coupling.